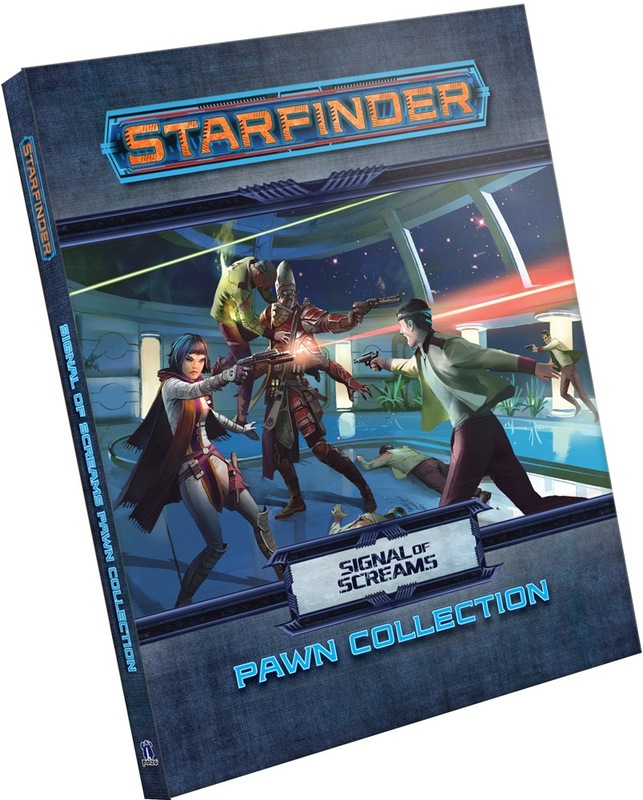 The characters, villains, and starships of the Signal of Screams Adventure Path come alive on your tabletop with this collection of more than 100 creature and starship pawns, designed for use with the Starfinder Roleplaying Game or any tabletop science fantasy RPG. Printed on sturdy cardstock, each of these double-sided pawns slots into a size-appropriate plastic base from the Starfinder Pawns Base Assortment, making them easy to mix with traditional metal or plastic miniatures. 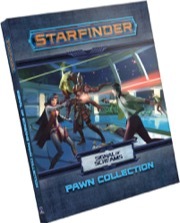 With dozens of distinct images, the Starfinder Signal of Screams Pawn Collection depicts the enemies and allies from all three adventure of the Signal of Screams Adventure Path. Roughly one third is printed so dark that you can hardly see it! This product is listed wrongly for april 2018 instead of 2019. That being said, i find it positive that the three-part APs get their own pawn collection for a lesser price ($19.99 instead of $24.99 for a six-part AP), but it makes no sense to me that it still comes out three months after the final installment. Because with three installments it's much less work to see which characters & creatures need additional art comissioned than with six installments, it should take less time too, until the pawn set releases. One month seems to be too close, but two should be possible imo. Also, we seem to get a lot of pawns for this "short AP" - which is cool. Having leaved through AP#10 & #11, i can understand why this pawn collection takes until april to release, as there are quite a few characters appearing, which don't have art or only head-shots.